How to lock your Helmet to your Motorcycle? Wearing a helmet when riding any form of bike is an extremely important part of operating that vehicle as it relates to keeping you safe and ensuring that you can safely ride your vehicle wherever you may want to go. Likewise it is important to keep our possessions safe, and this includes your helmet. But there are many situations where you cannot keep your helmet on your head when you leave your bike. Situations such as going to the bank, convenience store or a jeweler store for fear that they may think you are an armed bandit, as it conceals your face. This is a serious problem and a position you cannot afford to put yourself in. Additionally you can’t always be expected to carry your helmet around with you. Other situations where you need your hands for other tasks such as carrying heavy items or groceries where it would be a significant hassle if you had to your large and cumbersome motorcycle helmet alongside your goods as well. With that in mind there are still tools you can use to keep your items protected, which comes in the form of motorcycle helmet locks. These locks are useful in protecting your equipment from harm as well as keeping your motorcycle safer, allowing you to go about your day without being inhibited by your choice to ride a motorcycle. What should I lock to my motorcycle? When locking up your motorcycle helmet you will want to use a motorcycle helmet lock. How do these differ from regular locks? For the most part they are design with this purpose in mind that they will be placed on a motorcycle and the helmet will be attached to them, preventing the helmet from being removed. This is important to remember when selecting a lock as these are designed specifically for this purpose. Purchasing a padlock and some metal wiring as your locking technique is not only unintelligent but also dangerous. A weaker non-specialized lock will attract unwanted attention and also prevent actual safety of your items. Bike locks are made with durability, safety, complexity, purpose and portability in mind to make them perfect for their assigned task, unlike other alternatives will not do much to help you. There are definitely alternatives to bike locks but to feel completely at ease you will want a certified bike lock, to keep your stuff safe. What are the best items to lock my helmet to my motorcycle? There are varieties of different motorcycle helmet locks that you can purchase however it may be difficult to determine what to look for. Here is a small selection of a few locks that may be suitable for your motorcycle and your motorcycle helmet, however further on it will be discussed what further aspects there are to look into. This small motorcycle helmet lock is one of the cheaper and less cumbersome options of the motorcycle helmet locks available, but it is essentially there to just ensure a quick form of protection for your items. It contains a 4-pin tumbler security, dead-locking mechanism as well as a keyed version if that is the one for you. 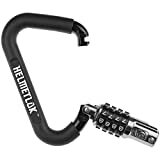 Created by the brand “ Biker’s Choice”, this relatively lightweight lock affixes around the bar of your bike where you attach your helmet and lock it in. It contains 1-way screws which are tamper proof to prevent thieves from unscrewing it and is a chrome plated, universal lock which will always be on your big no matter where you go. One of the different styles available, this carabiner style lock maintains a 4-digit code, simplicity in its design and is small and compact allowing you to bring it with you wherever you go. Additionally the design is not exclusive to motorcycle helmets, allowing you to put it to other use if you need it for another task. What should I look for in locks? Durability is important, as you want your lock to be able to withstand attacks from thieves who would want to get your motorcycle and your helmet. If it is not durable then it is not an efficient working lock, so the materials used in its creation play a key role in determining if it is strong enough. Safety is a smaller factor, as it is simply a locking mechanism. However with that in mind the lock should not be loose or risk getting caught in any part of the motorcycle where it can cause serious damage to the bike or yourself. Ensuring it can be attached securely or removed easily is important. Complexity of the lock is a mixed bag. On one hand you want it to be more complex so it is harder to crack, but also simple enough to open by you when you want your helmet back. 4 pins or a key are a standard safety mechanism, however you can get some with dual or 6 pins for extra protection. Key Takeaway: Having a very large lock is not practical, as the motorcycle is supposed to be mobile. With that in mind bringing the lock with you should not hinder your method of moving around. The lock should be easy to bring with you as well as encompass the previously listed features so it can still efficiently protect your items. With all of this information in mind you should hopefully have a better idea of what kind of motorcycle helmet lock you want and what the best one is for you. 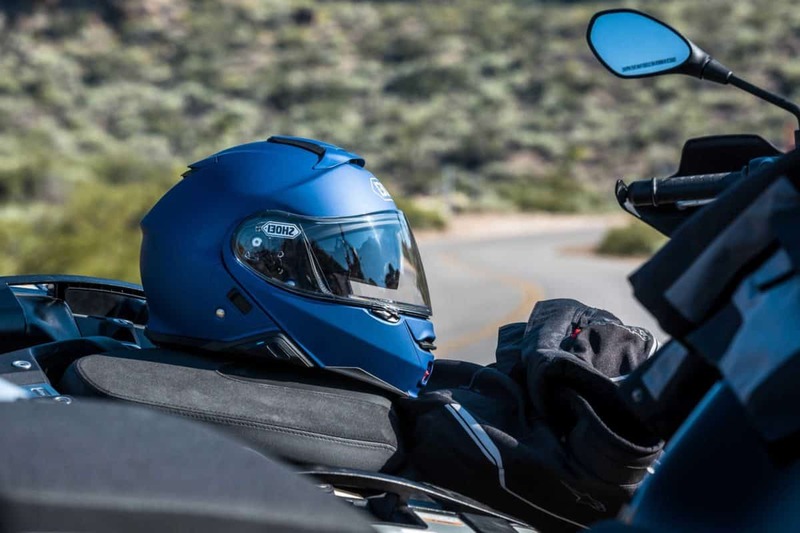 It is an important item to purchase and one that you should not avoid, as having a helmet is core to keeping you safe when you travel and safety is the most important thing to remember.